INDIANAPOLIS — With support from a three-year $1.2 million grant from the National Institute of Dental and Craniofacial Research’s National Dental Practice-Based Research Network, researchers from the Regenstrief Institute and the Indiana University School of Dentistry will conduct an analysis of electronic dental records of patients treated by community dentists across the United States to explore the feasibility of using electronic dental records data for clinical research, with the ultimate goal of improving oral health care nationwide. For the first time, investigators will use data mined from electronic dental records of thousands of individual dental-practice members of the NIH-supported National Dental Practice-Based Research Network to assess treatment outcomes for posterior composite restorations and for root-canal procedures. Both are tooth-conserving measures. The Regenstrief Institute and IU School of Dentistry researchers will also explore the feasibility of combining data from different electronic dental record systems with their varying formats and operating systems, a process that has proved difficult with electronic medical record systems. Among the de-identified data to be collected will be demographics, reason for visit, medical and dental history, social history, tooth characteristics and treatment, as well as practice and practitioner characteristics. Thyvalikakath is the founding director of the IU School of Dentistry’s Dental Informatics Core. The core’s primary objective is to enhance patient care through improving data capture and documentation, designing clinical systems to support clinicians’ and patients’ needs, and facilitating communication to promote coordinated care among medical providers. The Regenstrief Institute’s Center for Biomedical Informatics is focused on the mission “better health through informatics.” The center is a global collaborative research-and-learning organization, developing and evaluating innovative informatics solutions. “This project is another example of groundbreaking research that uses data from electronic patient records to inform what works and what doesn’t in clinical practice. The ‘Learning Healthcare System’ closes the loop between generating and learning from data on a day-to-day basis. 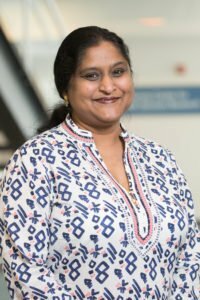 I am happy to see Dr. Thyvalikakath help lead that charge in dentistry,” said Regenstrief Institute investigator Titus Schleyer, former director of the Institute’s Center for Biomedical Informatics.